Jill Anding, center, with the first place trophy from Albion Soup Cook-Off. 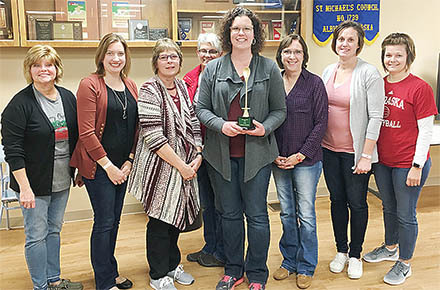 Various types of chili provided the winning entries at the Albion Chamber of Commerce soup cook-off last Saturday night, Dec. 16, at the Albion KC Hall. Jill Anding placed first with her spicy green pork chili. Lisa Thayer was second with a white ranch chicken chili, and Sharon Casper was third with white chicken chili. A total of 10 entries were received. Chili and chicken noodle soup were served for the supper.